In my last couple of entries, I discussed getting to feeling like all things associated with food were terrible and then how I moved past that situation. That could be a sufficient set of posts to put out there, but I felt like I should post a bit on how I got there. This is as much for myself to have something to look back to as it is to share, but I hope others will find it valuable as well. Lots of things, but let’s start here: I love a farmers’ market. Oh, MAN, do I love a farmers’ market. I love the bustle of people. I love looking at all the produce and the cheese and the plants and the flowers (this time of year). I love seeing what other people buy. I love chatting with farmers. I especially love chatting with “my” farmers. Farmers’ markets actually do great things for my spirit. It’s no wonder I ended up at the nearest market to my home 14 hours after landing in Chicago. I’d missed a solid month of my farmers at my markets. And, to be completely forthright here, I’d missed more than that by both not realized when my favorite markets opened and then repeatedly forgetting what day it was, until it was too late. It turns out that missing my farmers at my farmers’ markets? It’s completely crappy. Missing everything else that goes with it? Well, let’s consider: I completely missed Chicago’s strawberry season this year. I missed most of black raspberry season. I thought I’d missed corn season. I did not manage to talk to my pig guy and see about buying another pig1. Heck, I haven’t even SEEN my pig guy in almost three months! Having missed out on all this stuff probably is a big part of why I ended up in a funk. Farmers’ markets are one of my places. I need to make a priority to visit one or more in chaotic times, it turns out. This isn’t, “I need to make sure to visit one on every vacation”, but it’s not a bad idea. Part of the reason I love farmers’ markets, of course, is that I love food. Love it. I always spend too much time and maybe a hair too much money at farmers’ markets. Especially the Chicago summer markets, because there’s always so much gorgeous produce. And the day after we landed, especially, we didn’t have much produce in the house, so I had to go get some. Sadly, that’s also the day I crashed out and said, “I hate food.” And I suspect a part of it was that I’d gone nuts. 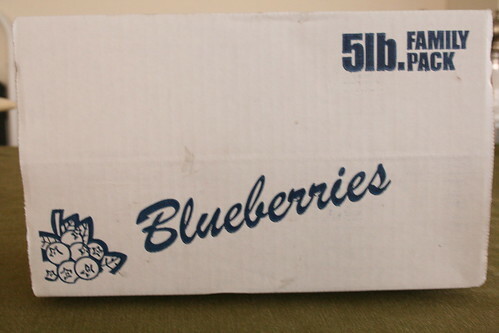 Specifically, I’d bought a 5 lb box of blueberries to freeze for winter. I bought it right then because I thought I’d missed the window when Steve offers the box2. I didn’t think about the fact that I’d need to figure out dinner that night (much – I think I did buy some “dinner groceries”). I didn’t think about having to do laundry that day. I didn’t think about giving myself a moment to readjust to my house. I didn’t consider that we’d left the house clean but cluttered and the clutter was going to make me batshit. Most importantly, for those blueberries, I didn’t consider that I’d have to rearrange everything in the big freezer to get to freezing. So when the crash came, I was completely unprepared. And, I really hate to admit it, but those blueberries did not get dealt with that day. And they became this symbol of frustration and anger for everything. I’d open my fridge and there they were. In their cute, round blueness, taunting me. Taunting me with my promise to myself I wouldn’t make jam this year. Taunting me that all I really know how to do is can a few things (plain), make jam and freeze things for winter. Taunting me that I’d missed strawberry season. Taunting me that I’d signed up for an online class on preservation through University of Georgia, had six months to do it, and never managed. My login had expired just before I bought those blueberries. I really want to get more into preserving my own food. I find it fun and satisfying. I started doing a lot of more of it last year. I canned tomatoes for the first time, which was a blast and kept us through canned tomatoes the whole year (almost). I made, with Rob, peach beer and blueberry beer. I canned peaches and blueberries3. Then, Bill and I went off and got married during fall harvest, and everything fell of. This year, we went on an epic amount of travel during early summer harvest, which has been more like late summer harvest, and missed so many things. I didn’t can or freeze a thing. This is all while reading more and more about kinds of preservation and who is doing what and how we can do cool things with preserving food for later. It wasn’t pretty. Not having preserved anything yet this year, not actually being able (for space and exhaustion reasons) to freeze those blueberries was a killer. And it lead to the final piece of today’s entry. Food waste. I’m so very, very tired of wasting food. And by “wasting food”, I don’t just mean those blueberries I’m embarrassed to admit I didn’t get to until they were a moldy morass of bad (though, to be sure, that kind of food waste extra kills me – especially when I do it). I also mean kale stems, which are only food in that they are a device to get kale leaves grown and then delivered from a farmer’s field to your home. I mean asparagus ends. I mean carrot greens. I mean coffee grounds. These things all represent nutrients that were pulled out of the soil somehow. They all represent biomass that some plant built with carbon dioxide, water, oxygen (yes, really), and light. They represent some farmer’s work, somewhere. And it doesn’t matter if I make stock out of it, and some point, some of it isn’t getting cycled back into the ground. It’s getting tossed in a landfill to, at best, anaerobically break down into methane and gross. This offends me more than I’d ever realized until this week of trying to figure out why the hell I came to hate food. It offends me on the levels that are probably obvious. The “foodie” and “hippie” and “into cooking” and “vaguely wants a garden someday” levels. Of course those levels are not thrilled with throwing food bits away. But it also offends me on an ecological level. And I don’t mean that as the “hippie” level you may be equating it to4. I mean it on an, “I nearly failed my preliminary examinations for my M.Sc. based on not having the nitrogen cycle memorized, and thus I’ve made myself very aware of the importance of nutrient cycling over the years” level5. Food, in particular, takes these nutrients (especially nitrogen, actually) and moves them some place completely removed from where they were picked up. In the case of things like say, coffee6, these nutrients are moved thousands of miles from the soil they were obtained from, and then we’re going to lock up whatever remains in a landfill? Holy crap, that bothers me. I’m sure, quite sure, that a bunch of this comes from my having met Jonathan Bloom at Edible Institute this year. I’ve followed his blog ever since, and so even though I haven’t read his book yet, I’ve learned a great deal about wasted food and food bits. It also comes from having a source to compost this stuff last year that I don’t this year. For five months last year, one of the vendors at the market I managed collected food scraps for composting. Bill and I took our coffee grounds and kale stems and, yes, food we just failed to eat to this vendor. It didn’t cover meat scraps and bones, but it was a lot better. It felt good to do that, and to know what was going on. This year, I’m not managing that market. I’ve been gone for ages. Things are not the same. And those blueberries, they taunted me. They taunted me with the wasted money and the wasted nutrients and so on. Not having a solution to this problem got under my skin in ways I never expected. It also has become the problem that, in all this mess, has been both easiest and hardest to fix. See, Bill and I had agreed we’d get a specific composting system after the market was over last year. And we didn’t. I’m now very ready to get this system. I am, pardon the pun, all systems go! But, actually, I can’t yet go. Mostly because I can compost, but then what? I live in a downtown 6th floor condo. I have some house plants, but only a few. I’m going to be eating all winter, which means compost all winter. What do I do with it? It’s a problem, but one I intend to solve. So. It turns out there’s been a lot going on to build up to my being so very frustrated. And figuring that out has and will be helpful to moving forward with this hobby/obsession/necessity for life I’ve got here. I hope it’s been as edifying to read as it was to write. Thanks for reading. I hope you’ll stick with me as I continue to explore these things. fn1. I actually don’t have room for another pig, but some of the buyers from last time want more. I would have coordinated. fn2. Honestly, I figured the absolutely terrible weather of this year would mean Steve didn’t offer a 5 lb box at all. fn3. Maybe you’ve noticed my two favorite fruits? Actually, blueberries are not as high on the list as this makes it seem. But I do love them. fn5. Yes, especially the nitrogen cycle. Why do you ask? fn6. Chosen specifically because it’s always shipped in from far away, and it’s always in our house.